The former cell phone salesman has won 100,000GBP and will perform before the queen. Congrats! 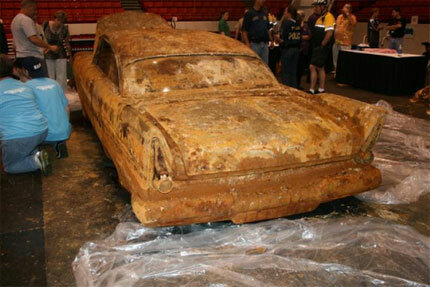 Unfortunately, the water that leaked into the chamber completely destroyed the car. The chamber was built to withstand a nuclear attack and included containers of oil and gasoline, in case the vehicles of the future didn’t use these substances. However, the people of 1957 had no idea that something as simple as water would ruin their gift to the future. They probably also had no idea that Plymouth would cease to exist as a brand, a decision made at the turn of the century by Chrysler’s German owners. The Tulsarama! site has more photos in their gallery. Finally, it turns out that sometimes government agencies can get it together enough to get a vital piece of infrastructure rebuilt in 25 days. It also helped that they offered a $200,000 a day bonus for early completion, capped at $5m. Full coverage at the Chronicle.